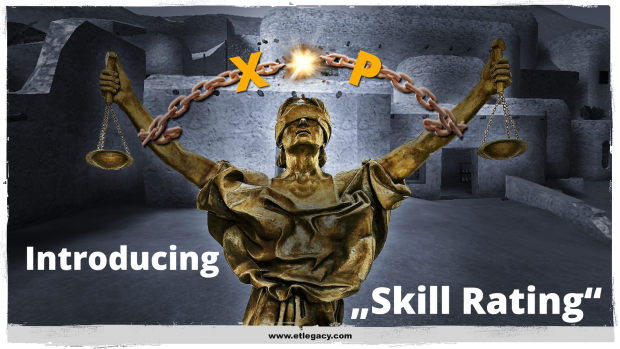 ET: Legacy - Introducing "Skill Rating"
Let's measure your skill instead. Enemy Territory implements XPs, which measure player scores based on specific actions, such as kills, construction, or revive. They are also used to control the various skill levels, similarly to a RPG. While not part of the original game, the ability to accumulate XPs indefinitely, as known as "XP save", has been a popular addition in many mods. We all know it: players crave for their XPs. Players accumulate XPs like coins map after map, and they love exhibiting XPs on servers to show how hard and how long they worked to earn them. However, XPs don't give any indication of the real global performance of a player. At best, they merely give a hint about the time the player has played on a specific server. Saving XPs also create some imbalance by enabling special abilities given by skill levels permanently, such as adrenaline for medics which directly leads to the infamous "Rambo medics" that everyone hates. This has never been accounted for in the original game balance, where XPs were reset at the end of matches or the end of campaigns. With Legacy mod aiming to stay close to the original game design, it makes sense to not encourage the use of XP Save as so many mods do. Starting from the next 2.76 release, only the XPs earned in the current map or campaign will be displayed. Instead of the total accumulated XPs, we're introducing a new metric, known as "Skill Rating". The Skill Rating has been gradually implemented in the past Legacy release, with the final version being currently tested on our official test server. Connect now to etlegacy.com to have a preview of the system! Skill Rating is a new, proven metric that can be used to compare skill of players over time. As FPS require skills in multiple areas like reflex, planning, tactical analysis or teamwork, with the relative importance of these skills depending on the map, game mode, player roles or team compositions, a skill rating can be defined as a measure of "all parameters of a player that help his team to win" and calculated using a statistical approach. The idea of using statistics to estimate the skill of players isn't new. ETPub implements such a metric with its "Player Rating" that gives a normalized skill score. However, "Skill Rating" of Legacy mod is modeled after TrueSkill, a more modern algorithm that has been developed by MicroSoft for its XBox matching service. • It has many advantages over the ETPub's PR, and is very well documented. • It has been extended to take map bias into account. • Ranks will also be adjusted to reflect the global rating of the player, instead of reflecting the skill levels and XPs. The better you perform the faster you'll rank up. However beware, several 'bad' matches and you might lose a rank again. And now fire up the game and /connect etlegacy.com to give the system a test-run on our official test server. Feel free to join our Discord voice chat for proper teamplay. It is a value between 0 and 50 assigned to each player. It represents its ability to help his team to win the map. Rating will be updated after each map played at intermission. New players will have a rating of 0, and it will increase over time. The rating value determined by using the strength of the team, time played in each team and the map. The performance of disconnected players is taken into account. What do I need to do to have a good Skill Rating? Do whatever is necessary to win the map. What are the percentage numbers displayed on scoreboard (using double Tab)? The first value represent the real time estimate of each team winning the map, while the second is the map bias. The numbers show that the current game is unbalanced! The rating system takes balance into account when updating rating. It is thus "fair" to lose an unbalanced map. Winning a map against a much weaker team will not increase your rating much, but losing against a weaker team will make your rating drop sharply. Conversely, to increase your rating quickly, join the weaker team and win as an underdog! Where do I learn more about this Skill Rating system? For interested people that want additional details, see the related wiki document and implementation ticket. xp reset on campaign end was always popular on the old aussie public servers. Just a question, can you import etpro cfg to this game or..? That is correct. Unfortunately we can't maintain compatibility to ETPro and unless they revive their development, we will never be able to. This is why Legacy mod is a thing, it is supposed to replace ETPro in the long-run. It's interesting that you intended legacy mod to replace ETPro. I remember reading about the mod about a year ago and seeing several things that immediately turned me off from even considering it as an ETPro alternative. The biggest one I can remember was that it gave soldiers more health, reduced medic HP, and gave additional health to the team based on the number of soldiers rather than medics. These kind of changes aren't what I expect from something that aims to replace ETPro. I'm curious what you mean with 'several things'. This is not implemented, at this stage it is purely discussion. Over the years it became evident, that Rambo medics have a serious advantage on their side over all other classes. On the other hand soldiers with SMG are the most useless thing that has been implemented in the game. Feature #865 would balance that and forcing medics to play more with the team. But again, this feature is not implemented. Could you tell me which other features are (or might be) a problem for you/competitive scene? I'm happy to look into that. I will say though - even discussing a change like #865 scares me. Whatever argument you make, whether I agree with it or not, misses the point. Competition has had the same basic gameplay for more than a decade. You say "Rambo medics" are OP and maybe that is true, but in ETPro we've embraced them and made them our primary class. ETPro players don't want change. Making a change as major as #865 would be fine if it was changeable by cvar. But there would be a ton of work that goes into changing the mod. Global server configs would have to be rewritten, GamesTV would have to make major changes to process the new demos from the ETL's ETTV (and connect their hubs), CyberGamer would have to make changes to our anticheat in order to support ETLegacy, and tools for ETPro and its demos from the last decade would be lost. I'm sure there are a dozen things I'm overlooking, but my point is that it's a huge time investment to make these changes. If there were to be a switch, there would need to be certainty in what we're getting. Improved compatibility, bug fixes, quality-of-life improvements and updates? I could imagine a world where competition switches for those benefits Major changes in gameplay based on the will of a few? Not gonna happen. It would split our already-small community and lead to benefits that are far outweighed by the costs. You are raising very valid points. We do realize that there is a lot of work on your end with fully switching from ETPro to Legacy and we will do our best to help with that. There is proper documentation of all changes in our changelog, so you exactly know what has been done. Once people from the competitive scene start participating in the discussions on our development page or in our Discord channel, then we can work together. For example on #865 :D But your position on this is very clear. If I remember correctly Kimi participated in that discussion on Discord some days ago? You can help shape this mod, since it is actively being developed, so you exactly know what you can expect in the future. You can't shape ETPro anymore, because development has stopped. I know people might say it's perfect, but I'm assuming it's rather having embraced and adapted to possible flaws. The ET: Legacy engine and client both have received several bug-/exploit-fixes, etc. and it's running noticably smoother than 2.60b, so it is also a choice of engine and not only mod. I do realize that it is a sensitive topic, especially for competitive play, but the anti-cheat of ETPro simply can't be realiably working anymore, given its age, can it? Granted, some sort of AC is better than none, but we are starting to get busy in that section as well, see #1021. The tools for ETPro you mentioned are only lost, if they are closed-source. If they are open, then it shouldn't be too hard to ensure compatibility. What tools/functionality are we talking about here? Quote If there were to be a switch, there would need to be certainty in what we're getting. Improved compatibility, bug fixes, quality-of-life improvements and updates? I can't promise you anything regarding improved compatibility, because I don't know the tools for ETPro you were referring to, but for all other things I'm absolutely convinced that the ET: Legacy engine is seriously better than 2.60b and that Legacy mod has huge potential over ETPro, because we are very active. We do realize that for you it's not a switch over night, because there is likely serious discussion necessary to convince everyone to switch. However, we are happy to help with anything. If you have concerns, then please hop in to our Discord channel or directly in the respective tickets on the development page and voice them. Maybe after hard drugs someone would say such thing. Generally, I'd say it makes more sense/is more secure to start fresh with a legacy config and work your way from there. I like your concept and the whole idea of that project. But I guess you're several years too late with that.